That's a great photo. I remember the thrill of going to Atwood Stadium when I was a kid. Used to eat at Third Avenue Fish-n-Chips a lot, too, during Lent. Then in high school my best friend got sucker punched at Atwood, right in the jaw, at a football game. Sad to say, that's my last memory of Atwood. I lived on Prospect St, more or less behind home plate. I shagged a few foul balls that made it over the wall. The dead end street had lots of kids and Techer Peckers waiting for a pop foul to make it over the wall and into our hands. 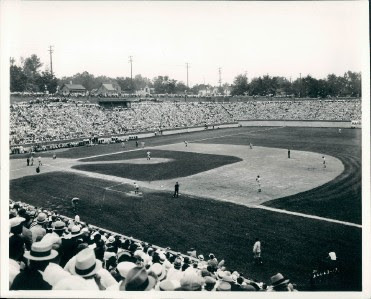 This photo is from the Prospect St. side of the diamond. Great place to spend the summer.